7th of November 2014: National and international organizations gather in the Humanitarian Space of El Mirador for a Humanitarian Commission to assess several aspects of the current situation of the community of El Tamarindo, Atlántico. FOR Peace Presence is part of the international team of observers of the Humanitarian Commission. The community is facing imminent threats of a further eviction of its settlers, with pressure growing daily from presumable land title owners, which coincides not only with the State’s negligence to move forward on the solutions agreed upon with community members, but also with the negligence of protections for the community in prior evictions. For example, the eviction on the 7th of November 2013, exactly one year ago, ended with at least three wounded settlers. About 12 years ago, farmers who had been forcibly displaced by the violence of the internal conflict started settling in El Tamarindo, which back then was a wasteland of about 120 hectares on the outskirts of Barranquilla, Colombia’s fourth biggest city. No one lived on the land, and no one was listed as owning it before they arrived. El Tamarindo is located in an international trade hub, the connection between the Caribbean Sea and the Magdalena River, one of Colombia’s crucial trade routes. With the arrival of the free trade agreements in 2007, the area was designated a free trade zone, Barranquilla Zona Franca, with import and export tax exemptions. That is when private landowners suddenly appeared and started claiming the land. To date, more than 40 official notices for evictions have been given to the community of El Tamarindo. Despite the joint judicial and political efforts by the community living in the territory to avert these evictions, already 66% of the 120 ha have been reclaimed in the last few years. The Police Inspector of Barranquilla has been in charge of the execution of evictions on the ground, in which the Colombian police and private security forces have been involved. The evictions have included physical and psychological violence, and have been destroying people’s homes, harvests and futures. With each eviction, effected settlers fled to the remaining ‘available’ part of the original territory, squeezing people more and more together and make it harder for them to sustain their living by farming. Some had to leave the territory entirely. 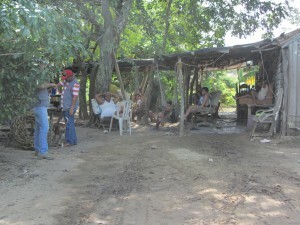 As of 2013 about 135 families have been living in El Tamarindo, most of which arrived about 5-12 years ago, and a large part of the community has organized itself as ASOTRACAMPO (Association of Farm Workers). In March 2014, further evictions followed, and today about 50-60 families remain in the last 36 ha that have not been cleared yet. This piece of land is called El Mirador. 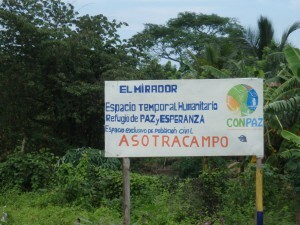 In April 2014, the families of ASOTRACAMPO, which occupy about 24 ha of El Mirador, declared this area as Temporary Humanitarian Space El Mirador, Refugee of Hope. The lots of land belonging to this space, which aims at non-violent auto-protection, are dispersed throughout the remaining 36 ha, and are basically lined up in a long strip of land next to a highway. About 47 families seek home and protection in the Humanitarian Space of El Mirador until a permanent, secure and dignified solution has been found for them. Earlier this year, on the 16th of July, FOR Peace Presence witnessed a very promising roundtable on a collective resettlement for members of ASOTRACAMPO. State, departmental, and district authorities were present, and competent district authorities promised to halt further evictions until a solution is found for the wellbeing of its settlers. Despite pressure from numerous organizations, the process of a resettlement has not moved forward since, and a second roundtable has not even been called for. On the contrary, by the end of September ASOTRACAMPO received notice that a request for evicting El Mirador was already in the hands of the Police Inspector of Barranquilla. Due to this urgency and the lack of any State response, ASOTRACAMPO, the Interchurch Justice and Peace Commission, the local office of the High Commissioner of Human Rights (HCRC), and the Mission to Support the Peace Process of the Organization of the American States (MAPP-OEA), together with representatives of the Ombudsman office, Defensoría del Pueblo and even more organizations, sat together and planned a Humanitarian Commission. The Commission’s objective would be to document the current needs of the community and collect extended demographic and social data of the whole community of El Tamarindo, including the families’ basic history of displacements related to El Tamarindo. With this exercise, ASOTRACAMPO and its allies hope to create a powerful “tool” to protect the community’s basic rights, a tool that helps to halt any future evictions until a permanent, secure and dignified solution for the community of El Tamarindo has been found, as promised. Here we are, 9:00am on November 7th, as part of the Commission to the Humanitarian Space El Mirador. Members of ASOTRACAMPO, initiating organizations, the Ombudsman Office’s ‘Personería Distrital’ and Victims’ Unit, students from a nearby university, and even more institutions and organizations of civil society gather in a big tent and then split up into several groups to collect the data from families living in El Mirador. In the tent, tables are arranged, and a set of interviewers gets ready for people who had formerly resided in El Tamarindo while another group of community members starts preparing lunch. 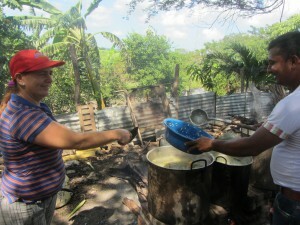 Up to 200 people are expected to take part in the process and need to be fed – Mondongo, a typical local soup, will be served. After everything is ready, the different groups of interviewers spread out and FOR Peace Presence joins the group of national and international organizations to begin observing the data collection and evaluate the current humanitarian situation of the people living in El Mirador. The Humanitarian Commission visits various families in their houses. Walking along El Mirador, we witness the precarious humanitarian situation of the residents. Some are still trying to construct shelters on friends’ pieces of land after the last eviction in March from a part of El Tamarindo that is just a stone’s throw away and is now cleared and unused. We wonder what people’s homes and harvests were destroyed for. Single houses of private security personnel and signs saying ‘private property – don’t enter’ are sparsely spread out through the evicted parts of the territory, which basically looks like a wasteland. A lot of the new housing of El Mirador not only lacks basic furniture or electricity, but also water and basic sanitary facilities. Initial crops could only be planted on the now scarce land after the end of the recent drought, and people are still waiting for the harvest, which is now their main source of food. Their last harvest and fruit trees were destroyed with the last eviction. 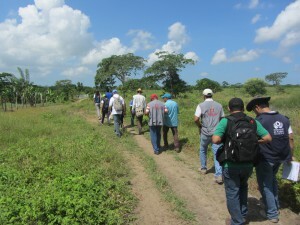 National and international observers evaluate the humanitarian situation in El Mirador. Moving from house to house we learn how highly contested the plots of land are. Displacement can have many faces, not only large-scale evictions. Different people claim ownership of plots of land within El Mirador, and with the threat of possible forthcoming evictions, residents receive different offers to leave their land for direct payments. We hear about payment offers between one to three million pesos ($460 -$1,400 USD) for one of the most desired pieces of land in Colombia, which come with a certain package of pressure. Residents inform us about middlemen who don’t allow residents to leave their own houses if they don’t take the money and ‘sell’ their plot. We also hear stories about offers that are wrapped in threats of evictions within days. We pass by a plot of land a settler just abandoned a few days before, and it is already protected by a new fence. The resident has found shelter on the property of a friend, being displaced from one plot to another within El Mirador. But how long will it take before they have to leave that piece of land too? Closing meeting in the Humanitarian Space El Mirador. At 2pm the mobile team of observers comes back to the tent. The interviewers are still busy collecting data, and the huge pots of Mondongo are almost empty. Even more than the 200 expected people have taken part in the event. Everyone slowly gathers in the tent for a closing meeting, where the observers share some reflections. The first numbers show that over 90% of the 135 families identified as eligible participated in the extended census today. Moreover, they shared their fears and hopes concerning their future. Former residents, observers and co-initiators of the Humanitarian Commission slowly begin to leave the Humanitarian Space, while we with FOR Peace Presence stay and mount our hammocks before the sun goes down. The reflections residents shared during the afternoon echo throughout the night: When will the statistics be ready? Will this common effort be able to protect the residents from a further violation of their basic rights – from further evictions, from further unfulfilled promises? One year after the violent eviction on El Tamarindo, residents are in daily fear of new evictions to come. 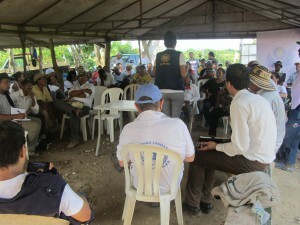 While ASOTRACAMPO and national and international accompaniment organizations, such as FOR Peace Presence, are waiting for the final numbers of the census and trying to advocate for respecting the residents’ basic rights, the private security entities that took part in prior evictions continue to establish their presence in El Mirador. The pressure on the individuals of the Temporary Humanitarian Space El Mirador is growing and individual forced displacements are already happening.